While supported by His National and International Staff, desires to promulgate the following declaration to be read by all democratic freedom loving people around the world. The organizations and persons associated with the Sacred Struggle for FREEDOM, DEMOCRACY AND HUMAN RIGHTS FOR THE OPPRESSED AND BEATEN DOWN PEOPLE OF VIETNAM wish to reinforce the philosophy and dearly held beliefs on the following non-negotiable principles of life, applicable to all human beings on all the continents of the earth. These undeniable truths necessitate that people possess Freedom of Speech, Freedom of Religion, Freedom of the Press, Freedom to assemble and the right to petition the Government to correct grievances and injustices. Out of the above stated rights, results in the unshakable belief that no one may be deprived of life, liberty and property without due process of law, meaning: A speedy, impartial jury-type of a trial allowing the examination of witnesses, with the right of appeal. In keeping with ancient and more recent (pre communist) history of Vietnam, the Land of the Dragons, a system of Constitutional Monarchy is advocated for Vietnam. The Imperial Family and many relatives still reside in exile, either in France or USA. Thus it is foreseen that a Constitutional Monarchy would uphold the principles of a representative democracy and give it respectability. A Constitutional Monarchy can perform the role of a proctor of the people whatever their creed, race, religion or political persuasion, from harsh or over adventurous politicians. The Monarchy can also help restore the fabric of society in its Arts, Culture, Religion, Judicial, Human Rights, even Trade, thus improving the view of the country to the outside world. The institution of Monarchy can and has been proven to uphold the judicial system for all people of its nation, thus allowing all a fair and equal trial by jury. The institution of Monarchy can embody the soul of a country in a way that no President can ever achieve. A Monarchy can also ensure the passage of good governance and legislation. In part of which is offering good council to a Prime Minister through regular audience. Also a Monarch can ensure a smooth transition from one elected government to another elected government at times of elections. This type of process works well in countries similar to Vietnam such as Cambodia, Malaysia and Thailand. Therefore monarchy can help protect the unimpeded right to vote based on secret ballots which shall be guaranteed on all levels of government; local, provincial and national. It would be advised that all elections be supervised by an independent appointed body that is free from political party constraints. Multiple political parties shall be permitted. That a just and full democratic government must be elected by all eligible voters. That multi parties be allowed to co exist without hindrance from the State, and throughout Vietnam, fully elected councils etc…. be put in place to help with the lower administration of government. That a just and fair civil service be put in place for the service of both government and people. No one may be deprived of their fundamental rights of humanity and citizenship. No one may be disadvantaged because of his or her gender, religion, ethnicity, national origin, state of health, or age. That a free market economy, based on a supply and demand and competitive market is most advantageous to a freedom oriented nation. The nation state of Vietnam shall be respected in its internationally recognized borders in existence currently, though history knows that recently boundaries have been changed, with much land being absorbed into China. The post-communist Vietnamese nation shall be disposed with friendship to all nations and with malice toward none. Once Vietnam has been freed from oppression, all Vietnamese in and outside the nation will be invited to work within a reconciliated Vietnam for UNITY, JUSTICE and LIBERTY based on ECONOMIC PROSPERITY that only a free nation can obtain and enjoy. In closing “Lets bury and learn from the past to build a future” (a quote often used by Dr. Hau Tuoc Nguyen Phuc Can Linh, GODA). 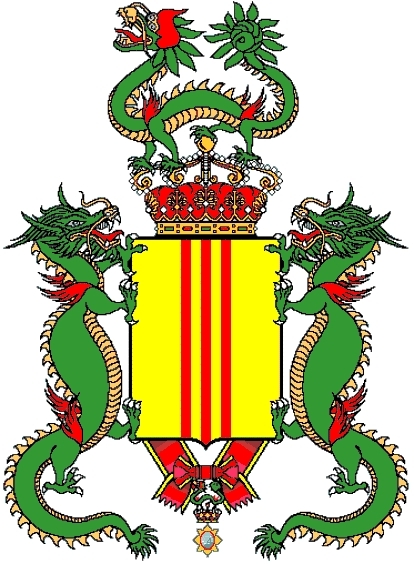 The structure of a Constitutional Monarchy can certainly help along way to achieve this goal, particularly when one considers that a Monarchy has existed in Vietnam, the Land of the Dragons for many thousands of years until recent events of history such as communism. A Monarch could and can act as a great healer for the recent past, for both the people and for the country’s soul. In offering this open letter to the world, We hope to seek the awareness and the possibility of help from all people who enshrine and respect democracy and history. Love and peace to all, who read this open letter.